Officials at the Office of Personnel Management pumped the brakes last week on implementation of a long-delayed pay raise for the vice president and top political appointees at federal agencies. 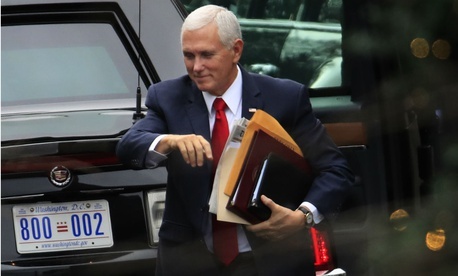 Since 2013, Congress has included a provision in its spending packages to freeze the salaries of the vice president, Cabinet-level officials and nearly 1,000 other political appointees. But when lawmakers could not approve a bill to avert a partial government shutdown last month, the language implementing the freeze expired, as first reported by Government Executive. That meant that starting with the pay period that began Sunday, those officials were due to receive a roughly 10 percent raise. On Friday, however, acting OPM Director Margaret Weichert sent a memo to agency heads announcing that the federal government’s HR agency would simply not enforce the expiration of the pay freeze, at least for now. In the memo, Weichert cited the fact that although Congress has not extended the pay freeze, it “may still do so” when it reaches a deal with President Trump to reopen unfunded federal agencies. News that Vice President Mike Pence, Cabinet officials and other appointees were on track to receive a sizable raise while hundreds of thousands of federal workers were either furloughed or forced to work without pay sparked a widespread outcry. The news also came shortly after Trump made official a pay freeze for all federal civilian employees in 2019.